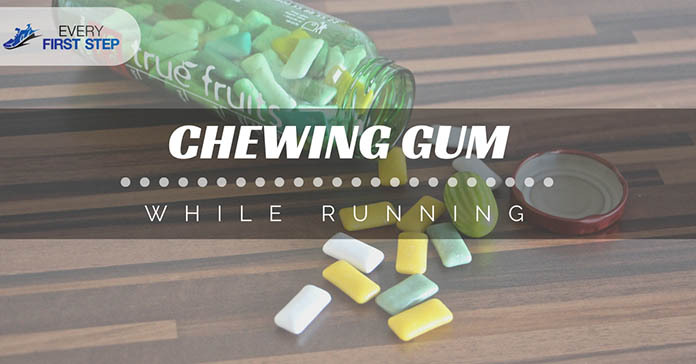 →What Should You Know About Chewing Gum While Running? Chewing gum while running has been a long debated topic. Many athletes can be seen chewing gum while playing or running. This may have you wondering whether chewing gum while running is a good idea. The reason why many athletes chew gum is that it makes them feel good. Some argue that the habit makes them perform better, so the question is what the facts are? Are there real benefits from chewing gum when you run? Are There Benefits Of Chewing Gum? According to gum chewers, the chewing motion helps them run in motion. The rhythm that you get from constant chewing can help to enhance the workout by providing a good rhythm. Another benefit is that chewing gum may help you breathe properly since you are forced to breathe through your nose. When it comes to scientific evidence, studies show that chewing gum has the potential of enhancing alertness and even boosting your mood. There are gums also that have caffeine added to them which can help boost performance. Generally speaking, though, there is no scientific proof that chewing gum can make you run faster or boost your performance. The reason behind the habit is simply a distraction. However, the following benefits have been observed by some runners. Although scientists have researched some claims, most of the reasons are based on runners ideas. Despite the benefits of chewing gum, some risks should be considered. One of the dangers is that chewing gum may become a choking hazard. This is especially the case if you are engaged in high-intensity sports or workouts like interval training. One of the most common problems that come from chewing gum is the chance of blocking your windpipe which may be dangerous. Although others may not agree with this risk, the result of a blocked windpipe may include falls and injuries. Another potential risk is if you are doing a running routine that involves alternating between jogging and running fast. People who engage in these workouts tend to breathe faster which increases the risk of choking on the gum. Bloating can also be a result of chewing gum because it makes you swallow more air than normal. Stomach issues or cramps may be the result. Getting into the habit of chewing gum can greatly increase your sugar intake which in turn will lead to higher dental bills. Even if you use sugar-free gum, the ingredients may still have health hazards. Some athletes claim that chewing gum on the run actually reduces your performance because it distracts you from your run making you less effective. If you want to maximize your running workout, chewing gum is a distraction and doesn’t help improve performance. If you get into the habit of chewing gum, you also have the risk of getting addicted to the habit. Such a habit can end up adding to your bills in the long run. The bottom line when it comes to whether or not to chew gum is obviously up to you. The thing to remember is that chewing gum will not guarantee a better performance although it might keep you busy. Also, the risk factors that are associated with chewing gum while running especially choking is something to be taken seriously. We hope the mentioned information will help you make a wise choice. Always remember that everything you do during your run will have both short term and long term effects. Before you decide to start the habit of chewing gum, make sure you know all the facts. Do you chew gum while you run? Do you agree with the information in this article? We’d love to hear about your experiences and ideas on the matter, so please share your thoughts in the comments below. Feel free to share this with fellow runners.